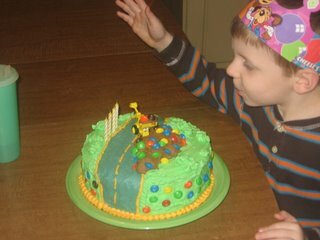 A mother who loves to do special things for her children+not owning the proper tools+having a child that wanted a cake with M&M's but loves Bob the Builder+ having no clue about cake decorating techniques+being silly enough to post the picture on a blog. 3. I saved a lot of money by not asking Walmart to come up with something. I think the cake is adorable! Isn't Ethan allergic to almond? Was there any icing left for him to eat? That cake is really cute. I'm sure you all enjoyed it!!!! Just had to show you!